Mumbai, 16th August 2017: The Department of Mental Health & Behavioural Sciences, Fortis Healthcare, organized the 2nd season of the national psychology quiz, aptly named ‘PSYCH-ed’ for school children across the country. The quiz is designed for students from Class XI & XII, aiming to test their knowledge of Psychology and allied sciences, pitting them against the brightest young minds of the age group. Conducted under the aegis of Dr Samir Parikh, Director, Department of Mental Health & Behavioral Sciences at Fortis Healthcare, the initiative witnessed national participation from over 1000 students, from 430 schools across 95 cities. 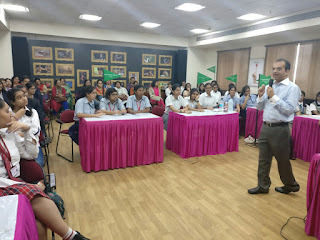 The semifinals of the Mumbai Zonal Round was conducted at S. L Raheja Hospital - A Fortis Associate, Mumbai on 16th August at the hospital auditorium, witnessing participation from 52 students from 14(of 430) schools. In season two of PSYCH-ed, participants geared up to step far outside their comfort zones, digging deep into their knowledge and understanding of the human mind. Students from Ahmadabad International School, Ahmadabad, Navy Children School, Mumbai and Lilavatibai Podar Senior Secondary School, Mumbai, battled other schools in the zone to enter the national finals. As a process, the winning team from each zone will qualify for the national final which is scheduled for September 1st, 2017 at FMRI, Gurgaon. These qualifiers would be from the participating schools across Mumbai, Ahmadabad, Bhopal, Indore, Trivandrum, Chennai, Pitampura, Gurgaon, Faridabad, Delhi, Meerut, Jaipur, Gwalior, Lucknow, Jabalpur, Manipur, Patna, Bhubaneswar, Amritsar, Shimla, Mohali, Chandigarh and even Singapore. The Winner, 1st and 1nd runners up teams will be awarded a cash prize of – Rs 50,000, Rs 30,000 and Rs 20,000 respectively. Free Comprehensive Psychology internships for all six teams who reach finale will also be organized at any of the Fortis centers. The top three semi-finalists from each zone will also receive prizes by Britannica. The initiative was supported by Mr Raj Gore, COO-South & West, Fortis Healthcare and Dr Bipin Chevale, Zonal Director, S. L Raheja Hospital. Speaking on this unique initiative, Dr Samir Parikh, Director, Department of Mental Health & Behavioral Sciences at Fortis Healthcare, said, “The overwhelming response and enthusiasm shown by the students, their parents and teacher encourages us to engage with more schools so children could be tasked to further their understanding of psychology and Allied Sciences. We will be tasking bright minds from one school into the finale, to declare the winners of PSYCH-ed 2017”.